Does it pay to watch what the Pundits and Gurus are saying about globalization and mother of all economic crisis? I have taking most of what the industry gurus are saying with a grain of salt. This said, the prophesies of financial wizards like Warren Buffet, George Soros and a few others certainly merit attention; perhaps on their insights to the way things will turn out in the long run, if not the short-term. 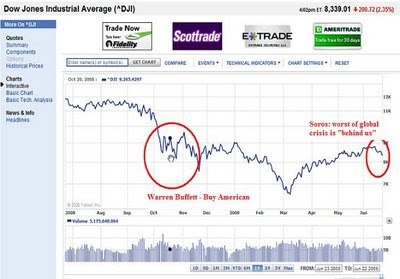 Warren Buffett wrote an interesting essay published in the New York Times during the height of the meltdown, in October 2008 ( "Buy American Stocks. I Am." ). The essay was well written and generated a fair amount of media coverage. For the chartists, a rearview of what happened in the market in the months after that essay by Buffet. “Billionaire hedge fund manager George Soros said the worst of the global financial crisis is over, and called for new international regulations to maintain open markets. “Definitely, the worst is behind us,” Hungarian-born Soros said in an interview yesterday with Polish television station TVN24. He called the crisis the most serious in his lifetime, adding, “This is the end of an era. The question is what’s going to come out of it in the future.” Without new international regulations, “globalization will fall apart,” possibly spawning a system of “state capitalism” like the one that exists in China, he said. Soros, who recently returned from China, said the world’s third-largest economy is “growing in strength” because the country was relatively unaffected by the crisis. Any student of Economics 101 is sure to tell us that a global downturn - like what we are experiencing now – will certainly lead to an uptick; but perhaps one thing even the gurus like Soros and Buffet cannot predict is: when?! There again, if they are able to predict it with certainty, would they be standing on rooftops proclaiming the fact, or be working quietly, making big bets to reap the rewards? Or do both?